Asides chatting over the phone or playing fun games over text, you can go one step further by sending your long distance person a care package. Care packages are a great way to show how special and important someone is to you. Whether it is a significant other in college, a boyfriend in the army, a sibling, a best friend that moved away, a sick friend or neighbor or an even for a homeless person, care packages are a great way to show you care. However, when it comes to sending care packages, the biggest problem you would face is deciding on the items to include in the box. In this post, I will be sharing some great care package ideas, hopefully, these care package ideas will help you fill your care boxes quicker. 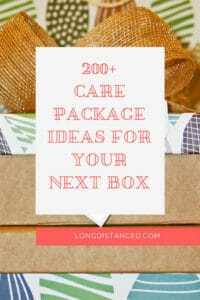 And that’s it, 200+ of best Care Package Ideas to include in your next package. Now, go ahead and build your own care package. Now, we’d love to know – have you ever sent anyone a care package, what did you include in them and how was the person’s reaction when they got your care package?